In the process of ‘destroying’ the artwork, a new one was created. 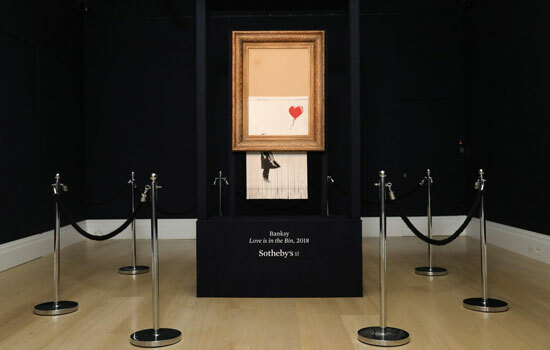 So said Sotheby’s after the infamous Banksy shredding, trying to ennoble the egg on its face as Eggs Benedict. 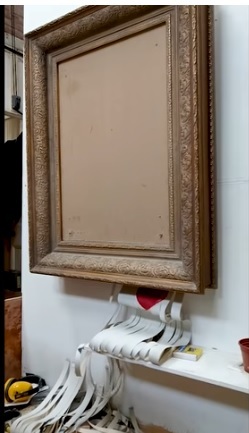 But the last benedict-ion belonged to the artist himself, in the form of his “Director’s Cut” video posted last week on YouTube (and embedded in my post, below), wherein he punctures the red balloon of auction-house pretentiousness. Banksy’s stealth video of the bidding on the above work at Sotheby’s and the sales job that preceded it adds yet another layer of satire to a subversive intervention that has a more serious subtext—a critique of self-sabotaging auction houses that have damaged their credibility as a transparent public marketplace where buyers can feel reasonably confident that they are paying fair market value, equitably arrived at, on a level playing field. 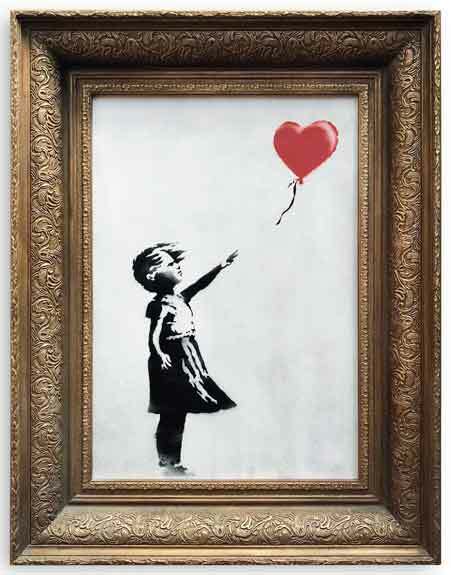 Sotheby’s, London, employee: Yeah, we’ve had a lot of interest on it [the Banksy], as you can imagine. It’s, I think, by far the most asked-about lot in the sale. Another Sotheby’s employee: Yes, and the artist put the frame on it as well….He quite likes the romanticism of having the National Gallery-esque [!?!] frame. Cut to the Sotheby’s partygoers enjoying a good laugh (as Banksy and his merry pranksters, observing this swanky scene, must be also having, for different reasons). Sotheby’s employee: I think this [the $260,600-390,900 presale estimate] is a fair price….Everyone’s got a chance! At the end of the “Director’s Cut,” we hear the merry pranksters laughing at the final product of their art-shredding machine during a trial run. But the joke was not only on Sotheby’s, but also on them: Because the machine misfired in the salesroom, leaving the work still partly intact and in its “National Gallery-esque” frame, it is being semi-convincingly touted by market mavens as worth more than the undamaged painting. That value-added cannot be what the street artist had intended (unless the buyer was in cahoots with the conspirators). So is this the final episode in the slapstick comedy? Or will there yet be another installment—“Decimation Installation”—wherein “Love is in the Bin” (aka “Girl with Balloon”) is displayed in the buyer’s abode, where we can learn about the other side to this wacky transaction?